Around our house summertime means activities, and this means things of all sizes and shapes need to be inflated. Not all of us have room or budget for a high dollar shop air system, but a portable air compressor can be a great solution to the hand pump blues. With the small footprint and the low cost of a unit like this, it’s worth the invetsment to save all that hand pump action and trips to the gas station air pump. You do not want to use a piston based compressor for blowing up thin wall inflatable stuff, like beds in your example. First off, there is way to little air flow (CFM), it will take it a long time to fill the inflatable up, and second, the presure the compressor can attain is way too high. Most inflatables only want a few PSI, not ~100. You do much better with a dedicated high volume low pressure compressor, or just stick the hose in the vent end of your shop van and use that for inflatable beds and such. That being said, the small compressors are nice for tires, blowing the crud out of things, and unless you are a real fast carpenter, they doo a good job with nail and brad guns too. Just don’t expect to be happy with an impact wrench or an inline sander. There’s no reason a little compressor can’t run big air tools, if you’re happy with a low duty cycle. Sometimes a 5-second attack from the air wrench is all it takes to free that stuck lugnut, so who cares if it takes the compressor 30 seconds to recover? Add a Y-connector with some quick-connects, and leave your portable air tank plumbed into the system via a double-ended hose for reserve capacity during such endeavours. Remember to oil your air tools, especially if using an oil-free compressor. You should be oiling anyway, but sometimes the sparse mist from the compressor is enough to allow some neglect in that regard. With an oil-free air supply, manual oiling is essential. Ha! good call on the safety glasses when blowing stuff out. Once a guy I knew asked me what my most dangerious air tool was. I have lots of saws, and grinders, and drills, and this and that. So I thought for a moment and replied, my blowgun. He was like what? Your blowgun? Another guy that was there, and got what I meant was like that’s just the point, the most dangerious tool is the one that you respect the least. I like my compressed air and if there is one thing that I’ve found out about compressed air is that no matter how many CFM you have you always seem to want more! Jobs like spray painting, or running a DA sander, or sandblasting can really eat up a volume of air quickly, and steadly too. What I have done to satisfy my air cravings is make up a fitting out of a tee pipe connector, and a few air fittings, so I can gang two air compressors up. This method also works very well to extend the useful range of your air power too. You see just plugging in two 3/8″ hoses to get you 100 feet out you lose an awful lot of power, but if you put a tank inbetween those two lines, it acts like a capacitor in a circuit, storing the charge closer for you. Effectively eliminating your extension hose air restriction, and giving you the same power as you would get off one length of hose. As far as oiling air tools goes, that oil daily crap cast into the tools is BS. I have actually destroyed air tools by being too religious about oiling them! It can gum them up ruining the vane motors. And yes, I use air tool lube oil. So when you oil your air tools a couple of drops goes a longer way than really giving them a good shot I suppose. Oh, and Mathew, I use my air compressor to blow up pool toys all the time. I guess you just don’t understand about higher pressure and how that expands into volume, or something. 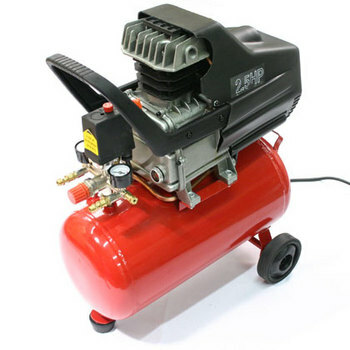 Hello,Am Kenny in Wisconsin ,I will like to know if you do carry Air Compressors instock for sale and i will like you to email me with the types and the price as well as the method of payment…Hope to hear from you soon.Thank you. I would like some prices to that thing sure would come in handy ! the compressor pictured use i use exactly the same thing for maintaining motorbikes spray painting ect comes in handy specially that i have to climb several flights of stairs with it each time i use it. I have compressure like this,and the plastic cover are broken. Were can I get a new cover?